Welcome to the 2012 McGill Summer Sports Camp! 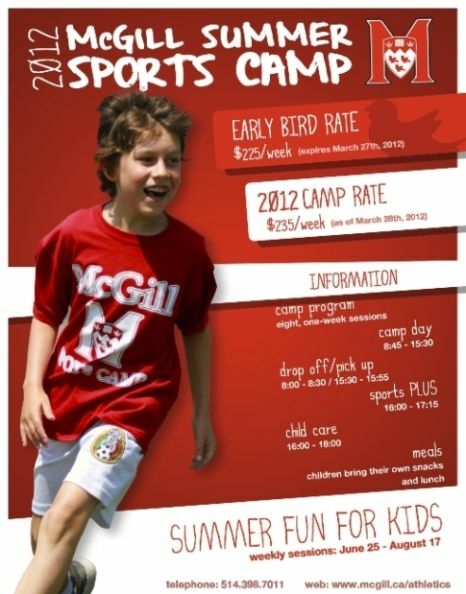 McGill's bilingual Summer Sports Camp is designed for children aged 6-15. Located on the edge of Mount Royal, in downtown Montreal, campers benefit from sprawling green spaces and the university's extensive athletics facilities. Mature and qualified instructors take pride in ensuring that each child benefits from a positive exposure to sport and physical activity. The program offered is divided into three areas of specialization (sports, aquatics, and creative activities, ie. arts & crafts, computers) and is structured to accommodate camper age, aptitude, abilities and interests. In each area instruction and supervised play are built into the activity. The McGill Summer Sports Camp features swim instruction based on the dynamic Olympic Way Program, a comprehensive system that teaches the four competitive strokes (Front crawl, back crawl, breaststroke, and butterfly) through a logical progression of skills. After camp Sports PLUS activities are a popular complement to the diverse day program. Activities are designed for children who wish to acquire or improve specific skills. Programs are conducted on a co-educational format and run Monday through Friday from 16h00-17h15. All skill levels are welcome and space is limited. The cost is $50 per child, per week. The camp also offers non-programmed, extended day supervision from 16h00-17h55 at the cost of $3.00 per child for the first hour (16h00-17h00) and an additional $2.00 per child after 17h00. Registration is not required for this service.